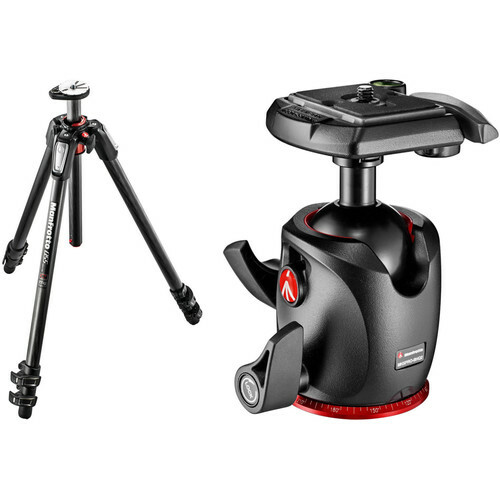 This B&H Kit pairs a Manfrotto MT055CXPRO3 Carbon Fiber Tripod with a 054 Magnesium Ball Head. The tripod can hold 19.8 lb of gear, extends from 8.1" to 71.5", and folds down to 28.6" for transport. It features a Quick Power Lock System that allows you to completely extend the tripod legs with just one hand. Once set up you can use the MT055CXPRO3's rapid center column in standard vertical mode or swing it into horizontal position like a boom with Manfrotto's 90° column feature. Enlarged tabs on the individual leg angle selectors allow you to get down to only 8.1" for macro work with the column in horizontal mode. And once you're down there you can attach any of Manfrotto's flexible or articulated arms to hold lights or reflectors via the Easy Link plug built into the tripod's spider. The 054 ball head is made from magnesium alloy, and has one lock for the movement of the ball, and another for the 360° panning. A notch in the head has an angle selector that allows you to put your camera in portrait mode at either a 90° or 105° angle. Included with the head is a 200PL quick-release plate for attaching your camera to the head. Box Dimensions (LxWxH) 25.0 x 5.5 x 5.5"
MT055CXPRO3 Carbon Fiber Tripod with 054 Magnesium Ball Head Kit is rated 5.0 out of 5 by 2. Rated 5 out of 5 by Parksjm from Well made Tripod Solid, good bang for the buck. Rated 5 out of 5 by Eddie from I would purchase this item again and recommend it to others. Very pleased with the tripod and head kit. Took it on vacation to Cade's Cove GSMNP right after I got it and it performed as I had hoped. What's the difference between the xpro and 054 magnesium ball head? If you are referring to the XPRO ball head vs the 054 head, then the 054 had an extra feature which allowed you to go beyond 90 degrees to 100 degrees when using the camera in portrait mode. Other than that, they are very similar in size and design. The newer XPRO removed that feature based on feedback from the user base.